Al Letson shields a demonstrator from attacks at a protest in Berkeley Sunday. UPDATE: The man Letson protected identifies himself as Trump supporter and video blogger Keith Campbell. 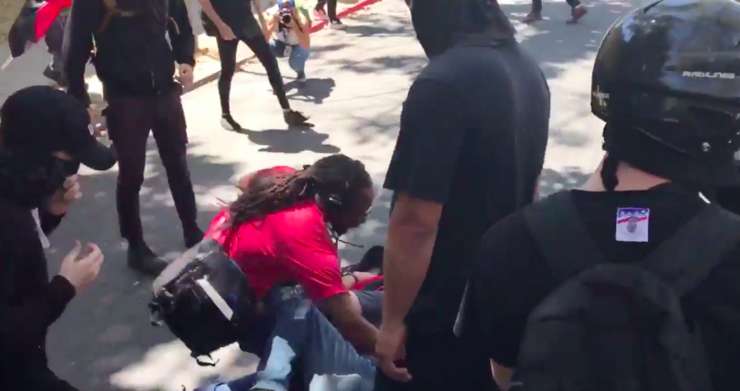 While covering Sunday’s “Rally Against Hate” in Berkeley, California, today, Reveal host Al Letson witnessed a man being attacked by a group of protesters. The man was balled up on the ground, fending off blows from several people. Letson, wearing a red T-shirt, jumped in front of the batterers, protecting the man from further injury. The altercation was caught on video by Mother Jones journalist Shane Bauer, who identified the aggressors as anti-fascist protesters, sometimes called antifa. He also said the man being beaten may have been a member of the alt-right. Letson was covering the event along with other Reveal staff members. In the video, he can be seen wearing his headphones, with his recording gear in a black satchel strapped across his body. Thousands of people had converged in downtown Berkeley Sunday in response to a planned right-wing rally dubbed “No to Marxism in America.” A huge police presence also flooded the streets to ward off violence between right- and left-wing groups. And barriers were erected around Martin Luther King Jr. Civic Center Park, where the rally was to have unfolded. The right-wing organizers had announced yesterday that they were canceling their events, and very few of their supporters had shown up. However, there were reports of several arrests and scattered skirmishes throughout the morning and early afternoon. Letson was at the Civic Center Park as the surrounding streets filled with left-wing groups, including members of the antifa, also known as the black bloc for their trademark black attire and face-covering masks and bandanas. Letson recounted what happened next, a scene he also caught on video: Right-wing organizer Joey Gibson arrived at the park shortly after 1:30 p.m. He and a couple of his supporters were chased by what appeared to be antifa members, who began to throw things at him. In Letson’s video, law enforcement officers can be seen standing on the sidelines, a protest policing strategy criticized during the violent April “Battle of Berkeley” protests and in Charlottesville, Virginia, earlier this month. Gibson continues through a line of police. Other videos from the scene show him being handcuffed. Meanwhile, Letson said, a man who appeared to be one of Gibson’s supporters was also chased by 20 to 30 antifa protesters, who began to kick and hit him with sticks. Letson dove on top of the man, suffering a few collateral blows but no injuries. Tear gas was released, quickly dispersing the crowd. Later, the man Letson protected reached out to him on social media. His name is Keith Campbell, 54, a President Donald Trump supporter and video blogger who was live streaming the rally on Sunday. He says antifa members know him from his conservative youtube channel Patriot Warrior Media – where he’s known as KPikklefield – and targeted him specifically. Campbell told Reveal he has no memory of Letson shielding him and only learned about it after seeing video of the attack. Campbell sustained bruised ribs and kidneys on Sunday, he said, but suffered no permanent damage. He said he has relocated out of state for the moment to avoid further attacks. Jack Smith IV, a senior writer at Mic, recorded the incident from another angle. In it, Letson can be heard urging demonstrators to stop their attack. There’s a brief pause in the confrontation, then another fight breaks out between two protesters who had been watching nearby. Berkeley Police, who were in charge of the law enforcement response on Sunday, did not respond to a request for comment. Media inquiries should be addressed to engagement reporter Byard Duncan, by email at bduncan@revealnews.org or on Twitter at @byardduncan.